Will Helmerich & Payne, Inc. Raise Its Dividend in 2017? The oil and gas company is a Dividend Aristocrat, but will it keep its streak alive? Oil and gas stocks have gone through tough times lately, and Helmerich & Payne (NYSE:HP) hasn't been immune from the volatility in the energy industry over the past couple of years. Yet the oil drilling rig builder and leasing company has something going for it that most of its peers don't: membership in the elite Dividend Aristocrats group, all of which have boosted their annual payouts each and every year for at least a quarter-century. Helmerich & Payne has gone a lot further than that, putting together a 44-year consecutive streak of paying higher annual dividends despite all the ups and downs in oil prices over the year. With oil prices starting to climb again, will the company make it 45 years in a row in 2017? Let's look more closely to see whether Helmerich & Payne can extend its streak this year. Source: Yahoo! Finance. Last increase refers to ex-dividend date. N/M = not meaningful; Helmerich & Payne had negative earnings over the past 12 months. Companies don't just get to be Dividend Aristocrats overnight. It takes a long commitment to dividend growth, and that can be especially tricky when you're exposed to the ups and downs of business cycles. The commodities markets have gone through bull and bear periods numerous times over the decades, but Helmerich & Payne has done a good job of finding ways to keep its dividend moving higher over time. Helmerich & Payne's early dividend history shows the impact of compounding on dividend growth. Slow-but-steady increases year after year gradually took the payout higher, and the drilling-rig maker took advantage of the methodology that the Dividend Aristocrats use to measure dividend increases. Specifically, because what's important is how much the company pays on an annual basis, Helmerich & Payne was able to make midyear increases once every two years but still maintain its streak. For example, in 2008, the company raised its quarterly dividend at midyear from $0.045 per share to $0.05. That meant, for 2008, it paid a total of $0.19 per share -- two payments of $0.045 and two payments of $0.05. That was more than the $0.18 per share it paid in 2007. Then, when it sustained the $0.05 per-share amount throughout 2009, as well, it led to a total annual dividend of $0.20 per share -- higher than 2008's $0.19. HP Dividend data by YCharts. Yet in 2013, Helmerich & Payne dramatically changed its dividend strategy. Company Board Chairman Hans Christian Helmerich said at the time, "Our bias is toward dividends, and we will consider dividend increases as an important component of building long-term value for our shareholders." In response, Helmerich & Payne more than doubled its quarterly payout from $0.07 to $0.15 per share early in 2013, and then boosted it all the way to $0.50 per share during the second half of the year. From there, two more dividend increases in quick succession brought the quarterly dividend all the way up to $0.6875 per share. Going back to old ways? Following that big jump, though, Helmerich & Payne has renewed its former sluggish growth in its payout. Since the last big raise in August 2014, Helmerich & Payne went through 2015 without changing its quarterly payout, and gave investors only a 2% bump in 2016. CFO Juan Pablo Tardio assured investors that, despite tough conditions in the energy market, "our strong balance sheet and high liquidity position, along with our firm backlog of long-term contracts and reduced [capital expenditure] requirements, should continue to allow us to sustain the level of our regular dividend payments." Note, though, that sustaining the dividend isn't the same as raising it. If Helmerich & Payne has indeed gone back to doing dividend increases only every other year, then investors might have to wait a while to see another increase. 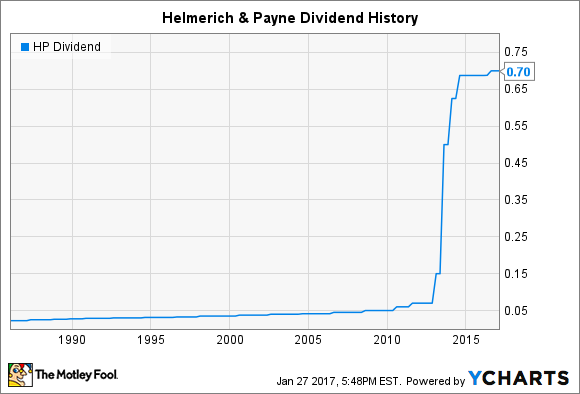 Will Helmerich & Payne raise its dividend in 2017? As far as the Dividend Aristocrats are concerned, Helmerich & Payne will be able to extend its streak simply by continuing to pay its current $0.70 per share dividend all year long, because that would bring the year's total above 2016 levels. Indeed, given the uncertain conditions in the industry right now, it's likely that Helmerich & Payne will take advantage of that technicality and choose not to do a dividend increase in its quarterly amount during 2017. Instead, look for another token increase in 2018 unless big changes in the energy markets warrant a different response.